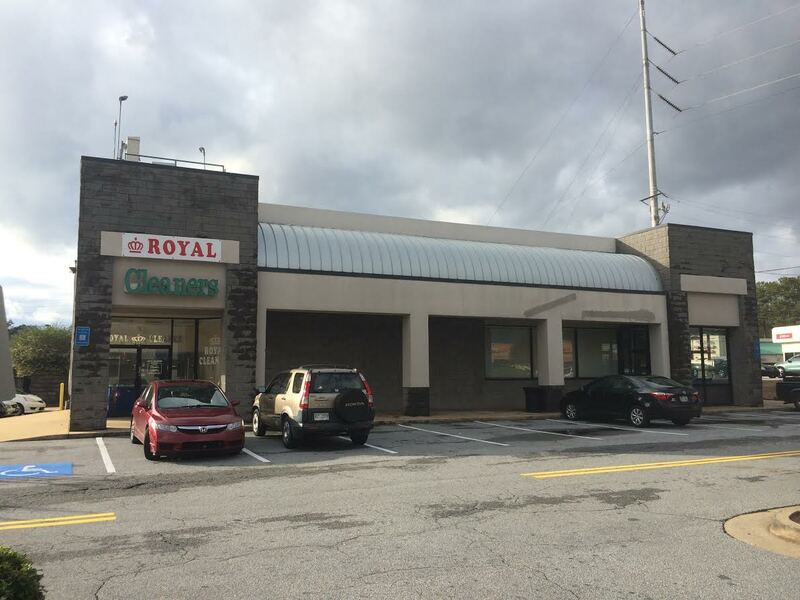 Blaze Pizza and Starbucks Coffee are reportedly going to share the former Evans Fine Foods (and recently vacated Royal Cleaners) at the Publix-anchored shopping center. Located at the corner of North Decatur and Clairmont Roads, Emory Commons is a good location for any brand looking to capture both Decatur and Emory area traffic, but parking can be an issue. Evans, a local mainstay for nearly 70 years, closed in late 2015 with rumors of a Blaze Pizza coming to the space starting to percolate this past summer. Repeated attempts to get confirmation from Blaze Pizza (via their official Twitter account) have proven unsuccessful. Interestingly, having gotten word of the executed lease just before the holidays, I tweeted them once more hinting at knowing it was a done deal. Their response was something vague (which has since been deleted) but the location at Emory Commons was added to the website as "coming soon" days later. The Emory Commons Blaze Pizza will be the first in Georgia for the Pasadena, California based quick-serve pizza restaurant started by Rick & Elise Wetzel of Wetzel's Pretzels. The chain has been targeting Atlanta for expansion for some time, and enters the metro area at a curious time. Local upstart Uncle Maddio's Pizza has closed over a dozen locations (including their original in Toco Hills in 2015), while Rize, another local upstart, is planning to open a second unit in metro Atlanta. Ohio-based PizzaFire is planning to enter the Atlanta area with a restaurant in TOWN Brookhaven, and is scouting Roswell for a second location. Despite existing and oncoming competition, Blaze does enter the market with some serious cred. Blaze surpassed $100 million in system-wide sales in 2015, having grown sales a whopping 205% year over year. In addition, NBA star LeBron James joined the company as an equity investor in 2012, and ditched a lucrative endorsement deal with McDonald's in 2015 to become more involved in marketing for Blaze. The Blaze Pizza "Franchise Brochure," provides the following criteria for "street locations." Ideal size is 2,000 to 3,000 square feet, plus an outdoor patio. We will consider 1,500 to 2,000 square feet, depending on expected volume. It's interesting the restaurant would have such specific quantitative requirements but just say "adequate," when it comes to its needs for parking. Having visited the Blaze Pizza in Nashville last year, I can attest to the fact that like other QSR pizza restaurants, Blaze will require a substantial number of parking spaces at peak dining hours. Yesterday, I observed a small crew onsite prepping the spaces to be delivered to their respective new tenants. The former Evan's space is 3,694 square feet with the Royal Dry Cleaners adding another 600 square feet. 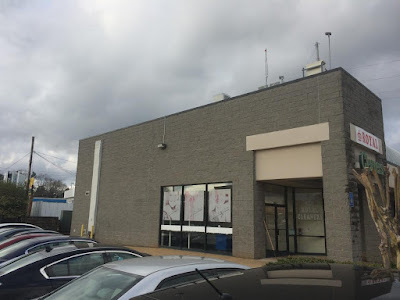 Blaze will likely take the portion of the building facing North Decatur and will likely occupy about 2,600-3,000 square feet with Starbucks occupying the balance. While Starbucks prefers drive-thru accessibility in new locations, I don't see Selig being able to offer them that feature in this location. Selig previously shaved off part of the former Chapter 11/Blue Elephant Books to create a drive-thru for Chase Bank and adding a second drive-thru to the center seems unlikely. This Starbucks would be in addition to the Starbucks at Suburban Plaza (another Selig property) which opened last year and does have a drive-thru. Sources indicate the Emory Commons lease may have been offered to Starbucks with "very favorable" terms to make up for the fact that the coffee company was forced to close its new Midtown location just a few months after opening it. Based on all that has to be be done, I'd guess neither Starbucks nor Blaze will be open until sometime this summer. Are you excited for these new additions to the Emory area? Have you tried Blaze Pizza before and if so how does it compare to other quick serve pizza options? Where would you like to see Blaze open next? I know someone will chime in and state that we should all take the bus, but I agree parking will be an issue. I can imagine how crowded it may be during the evening as shoppers also try to get into the Publix. However, I guess if a lot of the locals load their free range chicken and organic veggies into their reusable shopping bags and trudge to the bus stop they’ll be plenty of room for us to get a latte and a slice. Ham's comment above wins for 2017! Regarding Blaze Pizza : Unless the flour is flown in from Naples, Italy, > > Not Interested .. .. Parking or no parking. Adequate parking is a huge criteria for me in picking places to go. I'm not going to fight for a parking place. I like taking the Marta (train) but it doesn't go to a lot of places. ATL will never give up it's automobiles. Fake it even if you never make it. We don't need more pizza or coffee, especially in another overly-congested area already. I avoid this shopping place at all cost simply because of getting in or out reasonably, and this to me is a bigger problem than the lack of parking. While I try to find positives in things, I struggle to find any response besides this and SMH. Oh well. For those who do/will, enjoy. I'll be glad to stay out of the chaos.